The original Color Correct light, Full Spectrum fluorescent light bulbs with a natural light spectrum. The secret to Color Correct Light is in the color temperature. When our new customers give our lights a try, there is usually a lively response as they see their everyday environment transformed. Outdoor northern light has two light-rating measures. One is CRI (Color Rendering Index) and the other is a Kelvin rating. This natural color temperature has a CRI of 100, and a Kelvin 5500. What separates our Lights from the rest are color temperature ratings. CRS Lights's are rated at a CRI of 91 and at a Kelvin raiting of 5760. And the Artic Light at a CRI of 92 and a Kelvin of 5000. The main quality of an excellent color temperature bulb, is it's color rendering capability. Below are Spectral Emission Distribution charts. These charts visually show you the amount colors available to see within their spectrum. With sunlight, you get a full array of the color spectrum. Three observations. 1. Notice how the yellow and green peaks. This is what you see. 2. Notice the lack of color spectra, in comparison to the other lights. 3. The blacks are flat lining on the right, contrast and form visibility is decreased. 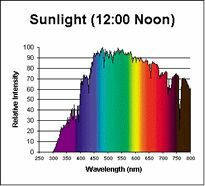 CRS Light's True Lite offers a full range of the color spectra. Compare. Closest to the light spectra of natural sunlight. The black is even significant to improve contrast and to show form. The Artic Lite offers a very white light with less spectra. If change is difficult, we recommend this bulb as a transition bulb.